Whilst everyone’s attention is fixed on the exciting developments on the Western Front, letters continue to come in from Old Dragons in more distant parts of the world. For the first time we have received a letter from the New World. Capt. Sholto Marcon (OBLI), having been given “6 months’ rest,” has spent the last two months of them in America, attached to a Military Mission. The Deming Club, Camp Cody, Deming, New Mexico. (British Mission). Sholto has taken the opportunity to explore the area extensively. “Many Indian tribes have made their home in the State in the past and even now, of course, there are many Indian Reservations and Pueblo Indian dwellings. The Apache and Navajo were most common, and one can get many blankets, mats etc made by the latter. Many families have been more than a little concerned for their young men following the German offensive that started in March 21st. News of their fate has been slow in coming through. 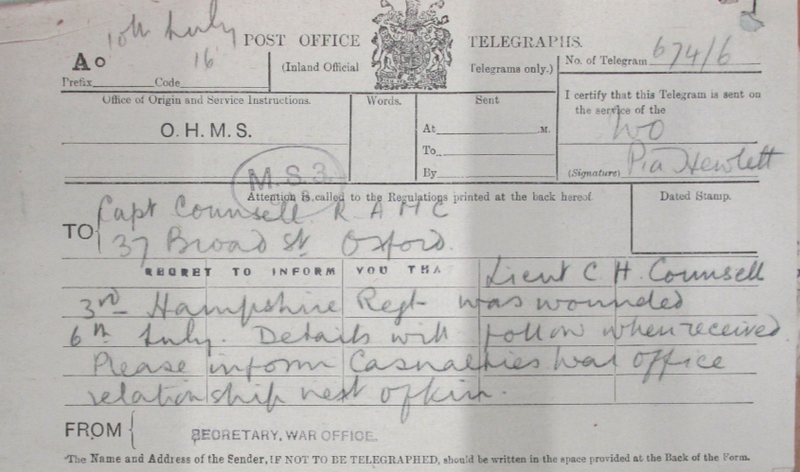 Mrs. Haig-Brown had not heard from her husband for two weeks and contacted the War Office for news on April 4th. 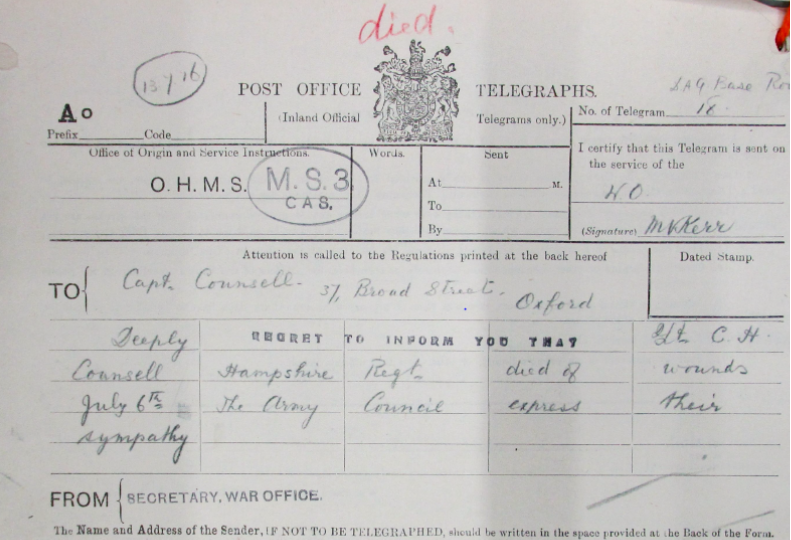 That same day she received a telegram informing her that Alan had been killed during the retreat, on March 25th. 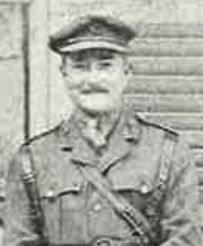 Alan taught at Lancing College before the war and played a key role in the development of the OTC; he aided in the training of numerous battalions before going out to become the Commanding Officer of the 23rd Service Battalion of the Middlesex Regiment – known as the 2nd Football Battalion. Alan was well known both for his writing and footballing skills. I have fond memories of Alan as a boy. His love of animals showed itself at a very early age; he was the originator of ‘pets’ at the School, and a goat which trotted about with him was the forerunner of many and various kinds of two, four and even no-legged successors: ducks, hens, kittens, snakes, tortoises, rats, mice, parrots, macaws, cardinals, cut-throats, budgerigars et hoc genus omne, may all claim to owe their appearance among us to Alan. Some of us may remember his introduction of a huge snake into the drawing-room of 28 Norham Road, and the ensuing hysterics of a parent. Three Old Dragons of the 2/4th Ox & Bucks have kindly sent their picture, just in time to be included in the December edition of our magazine. Capt. 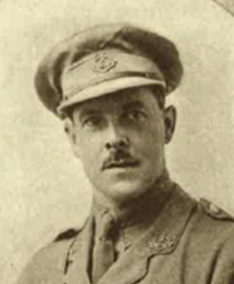 Geoffrey Rose tells us that the 2/4th Ox & Bucks near Arras were involved in a raid to draw the attention of the Germans away from Cambrai, just before the attack was launched there on November 20th. Capt. Walter Moberly and his company were chosen to carry out this diversionary attack, which was made on November 19th. 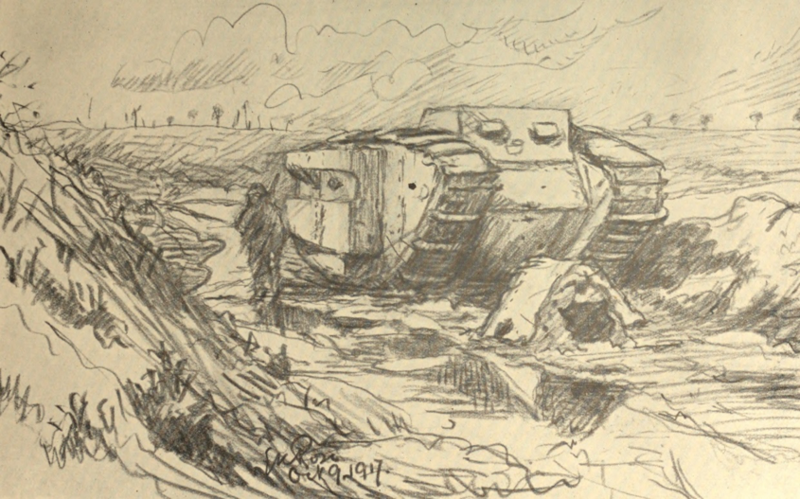 Much has been written of the great attack made at Cambrai on November 20th, involving over 400 tanks. The 2/4th Oxfordshire & Buckinghamshire Light Infantry were deployed to France towards the end of May last year and with it a number of Old Dragons. 2nd Lieut. Walter Moberly was an early casualty, wounded on a reconnaissance up to the German wire (in daylight). Only with great difficulty was he able to make it back to our lines. Capt. Douglas Rose, who returned home wounded in July, kindly wrote to us shortly afterwards with a full description of how he was hit. Happily his brother, Capt Geoffrey Rose is still going strong. Dec. 25th found us in (the trenches) less than a week. No fraternising of course took place, though a Hun, bored to distraction with the war in general, came to see us at HQ that day. A fine fellow, and, considering all things, most astoundingly clean! One experience I suffered: I had to be dug out of the mud one night, and not till one has suffered this experience can one realise that it is possible for people to get drowned in the mud. We had gone out to lay a line, and about 20 yards from HQ I stepped into a mud patch, and there I had to stay till a duckboard and a spade were brought, and my leg was dug up, as you would dig up a plant. The men stick the mud and weather conditions generally in splendid style, and are real bricks in all they do. Further information has been received on the death of Lieut. Christopher Counsell on July 6th. 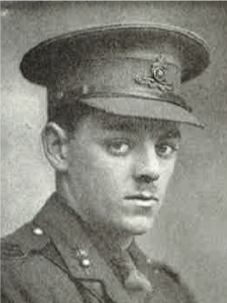 A fellow officer in the Hants Regiment, 2nd Lieut. Churcher, has confirmed that Chris was providing a covering party for a working party when he was hit in the head, and possibly in both hands, by machine gun fire. 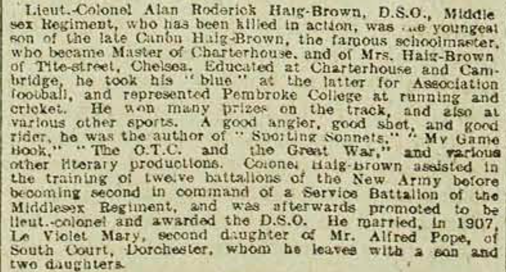 He never regained consciousness and died in transit from 89 Field Ambulance to 29 Casualty Clearing Station. 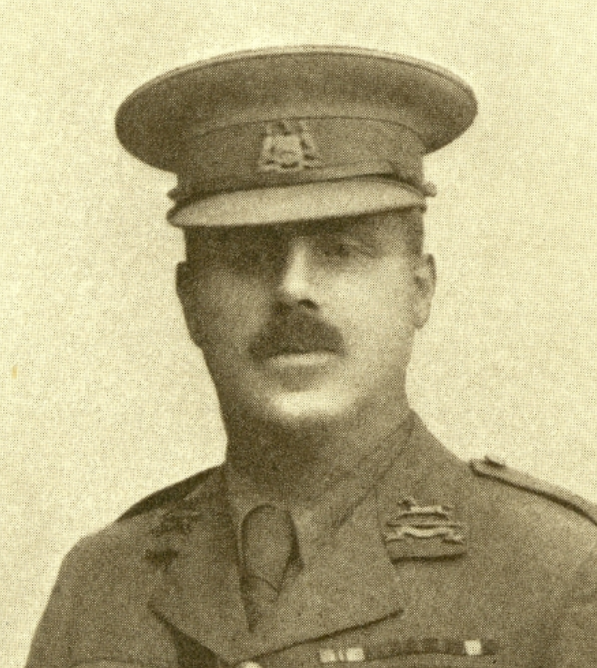 Oxford has converted a number of buildings to receive and treat the wounded and by chance a wounded sergeant in Chris’s company was brought to the Oxford Hospital at the new Schools. He said that Chris was always ready and eager to go out at night on any wild entertainment towards the Hun lines, and he was evidently greatly impressed with his Lieutenant’s daring. 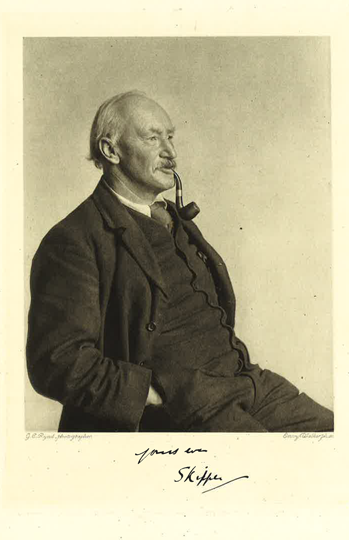 Christopher’s father, Dr H.E. Counsell (whose practice is at 37 Broad Street) is in charge of Surgical 5 in the North School. The Esson family have suffered another bereavement: Mr William Esson passed away in Abingdon aged 78 on August 25th. (Mrs Esson predeceased him, having died in 1893). His poor daughter Margaret lost her brother Capt. 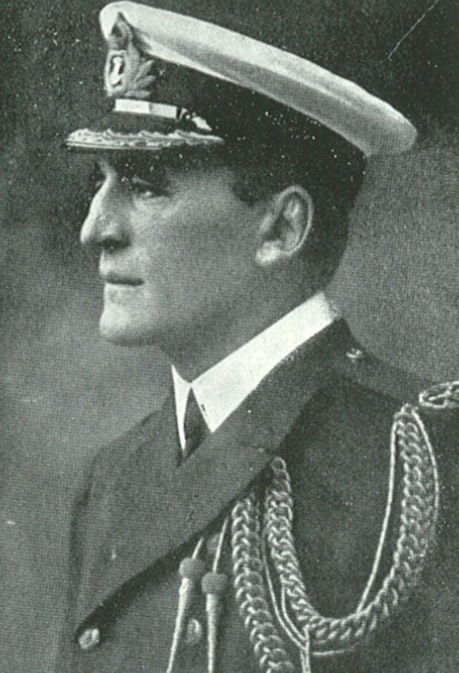 William Esson on April 27th 1916 on HMS Russell; her husband, Capt. Edmund Gay has been missing in action since August 12th 1915 and now her father has died, all in the space of just over a year. Three days later has come the news that Chris is dead. 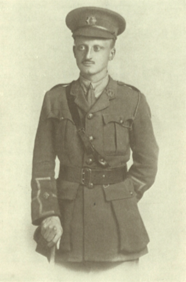 His battalion had received their orders too late on July 1st to launch a further attack on Beaumont Hamel that day and thus they remained in the original British Front line. Chris was providing cover for a working party on July 6th, whilst they placed some advanced outposts. A machine gun opened fire and Chris was severely wounded. It transpires that he died on the way to the Casualty Clearing Station.